It wasn't too long ago when a squeegee and a question from my daughter changed my life. Weird, right? 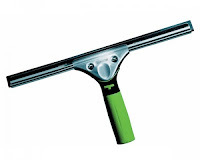 A squeegee. I know. Well let me explain. I had recently moved into a new home that had a glass shower enclosure. To prevent hard water build up on the glass, I bought a squeegee. Before getting out of the shower I would squeegee off all the water drops. It didn't take too long before the novelty of the squeegee wore off and it hung lonely and unused in the shower. Then one day my then 9 year old daughter asked me a question when I was getting out of the shower. Caitie asked, "Why didn't you use the squeegee?". To this I replied, "I don't know, I guess I just got tired of using it". The next thing she said changed my way of thinking. She said, "Why did you buy it, if you are not going to use it?". I didn't know how to answer this question. Did I purchase the squeegee for the fun of it? Did I really want the glass to stay in nice condition? Was squeegeeing to much work, or take too much time? Was I just lazy? Did I know when I bought it that I wasn't going to keep on using it? Was my own expectation of myself to only use it until I got bored of it, then push it aside? I picked up the squeegee and quickly ran it down the shower walls. It takes about 30 seconds to do all the glass. Surely I can fit that into my schedule, and it was worth it to keep the glass looking nice. I didn't know it at the time, but this moment, brought to me courtesy of a 9 year old child, would change my life and what I believed about myself. I squeegee my shower EVERY time I use it. The problem was that I didn't expect myself to keep on squeegeeing the shower, and there were lots of other things that I would start and not finish, or sometimes not even start, because I didn't expect myself to finish, so what was the point. I had come to accept this about myself - this was me, this was my make-up. I didn't like it and it impacted my self esteem, but I accepted it. Though this belief ran deep and affected many things in my life, I realized that it may not be 100% true. This idea stayed with me, and one day something happened that began to weaken that belief even more. I was getting out of the shower and realized that I had just squeegeed.... and didn't even realize that I had done it. Sounds silly, but I was floored. Could it be that I could have developed a habit, where a habit didn't used to exist? I didn't believe this was possible. The realization of this changed my life, my way of thinking, and made me recognize some other self imposed limitations I placed on myself, and made me question the other beliefs - things I believed true about myself and lived my life around. Well, that squeegee represents a lot more to me today than spot free glass. The squeegee serves as a reminder everyday - that I can choose who I am - and what I want to do, and who I want to be. The commitment to using the squeegee has helped me form a new belief - I can and I will do so much more than I previously thought I could.